BANGI, 9 December 2014 – Becoming a developed country is meaningless if the nation which aspires it still has racial disparities. Former Finance Minister Tun Daim Zainuddin said efforts to break the racial barriers should be done with a new paradigm to unite all races. Daim said when launching the book titled, The Colour of Inequality by Dr Muhammad Khalid early last month, he had said that the status of a developed country will mean nothing if the people are still earning below the poverty line and cannot afford to buy a house, along with continuous injustices taking place. “I standby that same statement and I stress that it would not be realised as long as Malaysians of various races, the Malays, Chinese, Indians, Kadazans etc are apart due to racial disparities,” he said. He was launching a book titled Transforming Malaysia; Dominant and Competing Paradigms published by The National University of Malaysia’s (UKM) Institute of Malaysian and International Studies (IKMAS), here today. The book featured contributors from IKMAS such as Principal Research Fellows Emeritus Prof Dato’ Abdul Rahman Embong, Prof Tham Siew Yean, Prof K.S. Nathan and Research Fellow Dr Helen Ting. It was edited by Prof Abdul Rahman, Prof Tham and Australian National University (ANU) Professor Anthony Milner, who had been a visiting professor at UKM. Daim, who is the patron of the Pok Rafeah Foundation at IKMAS, hoped that the book would prepare the ground for a new thinking about the country. “This book takes the history of ideas approach and attempts to analyse a very critical problem in our country, the question of the dominant race paradigm and its complications for the country’s future,” he said. 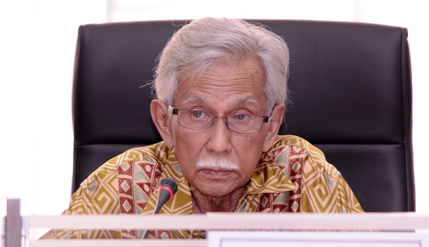 Daim said the book would inspire new thinking which could assist the country to achieve its 2020 vision and move further beyond. It contains analysis of various issues such as race relations, foreign workers, trade and foreign policies. UKM Vice-Chancellor Prof Datuk Dr Noor Azlan Ghazali, IKMAS Director Prof Dr Rashila Ramli and Dr Shaharudin Maarof, Senior Fellow of Universiti Malaya’s Academy of Malay Studies were present at the launch.